How to Become a Hotel Management Consultant? When we hear of a Hotel Management Consultant, we feel that the person knows all about Hotel and hospitality industry. ‘Hotel Management consultant’ and ‘Hospitality Management Consultant’ are used interchangeably and at times don’t give enough clarity on what they exactly mean. But before that, we will also decode what do these Hotel Management Consultants do. I am sure you have done the SWOT analysis of the Hotel Industry at least a few times in your illustrious career. As a hotel management consultant, you just need to be so good it that you can do the analysis of various facets of the hotel industry unconsciously. That being said, the hotel industry offers many exciting opportunities to work in a consultancy position, be it in an events firm, restaurant, hotel or even a cruise company. What Do Hotel Management Consultants Do? So you want to become a hospitality management consultant? Hospitality management consultants look to achieve one thing in the hotel’s big picture: improve productivity, but their work description changes from one hotel to another. Hotel Management consultants at times need to take care of property selection, legalities, property management, construction arrangement, operations management, training, staffing, and other strategy and management related functions of the hospitality organization. Some projects call for input from the entire consulting team, with each consultant having an individualized knowledge in one given area. Other consultancy projects are small-scale and can be executed by an individual. In essence, the work of a hotel management consultant entails going through internal documents, doing lots of research, interviewing employees, exploring expense reports, and tracking daily hotel operations. Of course, the starting opportunities for consultancy come in a huge variety and much earlier than these strategy advisory firms- from being an event planner, cruise ship planner to hotel concierge or even someone who can offer sound, actionable advice to restaurants/hotels. 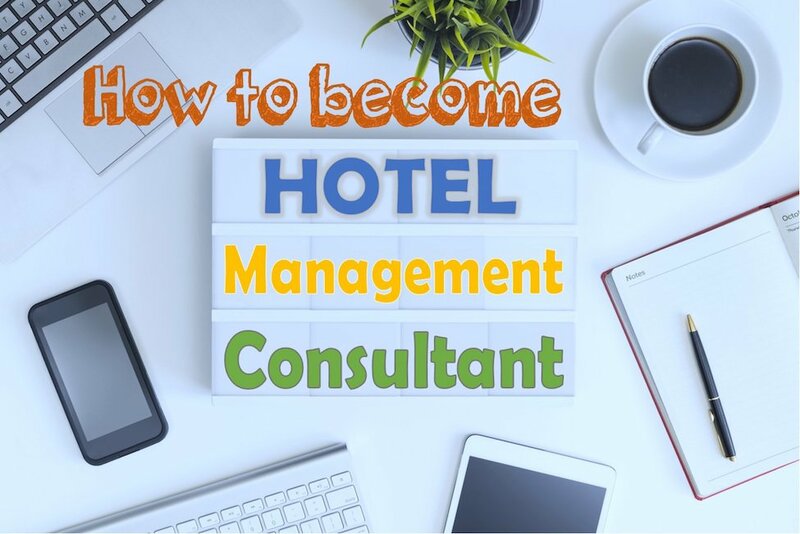 Well, the road to becoming a hotel management consultant isn’t always clear-cut, but following these steps can help you get started. Below we outline a few steps necessary to become a Hotel Management Consultant. The hospitality industry is undoubtedly one of the largest sectors in terms of reach, revenue, and employment or businesses opportunities. Every hotel or hospitality organization seeks improvement and growth. An increase in profits and a better market reach. There are a lot of things for hospitality establishments which needs careful analysis. So, good consultants come handy for a better growth strategy. One of our earlier posts discusses a Step by step guide to Bachelors degree in Hospitality to help you get through the phase of the dilemma. Here’s the thing: although a bachelor’s degree is not essential for a hospitality management consultant, it sure will give you a good head start. Also, degrees tailored specifically for hotel management consultancy are rare; however, you can earn a related degree, especially one in hospitality management. The good news is that there are a plethora of accredited schools that provide these courses, with some of them offered exclusively online. A course in hospitality management gives you an excellent foundation in the skills and knowledge you need to thrive in the industry. So, do a little research to zero in on the best college or university to pursue your bachelor’s degree in hospitality management. You can squeeze in some time for an internship or part-time job in-between semesters or right after graduation. Right after garnering their bachelor’s degree, some candidates look to plunge directly into the hospitality management consultancy. Getting experience in the hotel sector is as crucial as pursuing a degree in hospitality management. You’ve to learn the basics and ropes of the industry first; get to know all the nitty-gritty stuff. Your employer will be glad to know that you’ve submerged yourself in the hotel scene. The experience can come in the form of an internship, part-time or full-time job, preferably after finishing school. If you are looking for a job in the hospitality industry visit our Search Hospitality Jobs section. One of our earlier posts mentions Best Hospitality Job portals around the world . If you feel that you are ready to delve right into the hotel management consulting scene, you may want to skip this step. Otherwise, earning an MBA or related advanced degree can help propel your career. Of course, business or hotel management advanced degrees are popular among lower-tier, middle-tier, and elite universities and colleges. Also, there are many reputable online masters degrees. You have to be careful, though, to avoid unaccredited institutions. A hotel management consultant is a fully-fledged, professional position that requires a series of accreditation. This one is one of the key steps to become a successful Hotel Management consultant. Getting one of the Top Hospitality Industry certificates would not only step up your game but would also help in getting you invaluable exposure in consulting. The certification isn’t essential, but it will make you stand out in a sea of other non-certified consultants. One indispensable certification is the Certified Management Consultant (CMC) that are offered through the Institute of Consultant Management. When you have gained some education, experience, and certification, you can now hunt for some consulting work. At this juncture, you must have a good idea of your field of speciality. It could be something as simple as helping a hotel design or purchase spot-on towels and other amenities. Or something complex as running training workshops. Jobs on LinkedIn are easiest these days and have a plethora of options in the hospitality consulting field. So, do give it a shot to get the desired job once you are through the above stages. Hotel management consultants who have mastered the ropes and have built up a good track record with many clients can consider going at it as independent consultants. On the upside, you will earn more for your work and enjoy lots of autonomy, but on the downside, you will not have the benefits or protections afforded by working for a consulting firm. So, think before you act. Hope that by now you are more aware of the process that involves the transformation of a hotelier or hospitality professional to a Hotel Management consultant. Becoming a good hotel management consultant would need some sustained hard work. However, the whole exercise and efforts in the direction are worth it. The rewards and perks make all the efforts taste super sweet at the end.